"I am delighted to announce some exciting upcoming improvements at The River. On the heels of the nearly complete and extraordinarily successful redevelopment of the Rancho Las Palmas Shopping Center, the owners of The River are moving forward on a number of improvements and activities to bolster this all important leisure and entertainment venue. Work is underway for a unique new restaurant in the space formerly occupied by Sam's Sushi. Fox & Fiddle is a British-style pub based in Canada with a focus on providing a great social experience paired with specialty drinks and fine pub fare. Already very popular in Canada, Fox & Fiddle should enjoy great success here. Almost immediately after the departure of BB's, ownership of the center received very strong interest from a number of operators for this highly desirable location. With arguably the best patio in the desert and a very open and inviting interior space, it is no wonder why representatives of The River are reporting that an announcement for a new tenant is expected very soon. 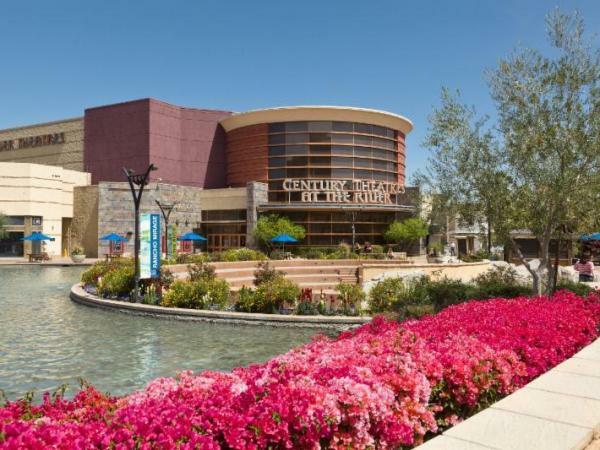 Moviegoers will be pleased to soon find a number of new lobby amenities and luxury lounge recliner seating at the ever popular Century Theatres. The River will be presenting and hosting what will certainly be one of the desert's most popular and spectacular activities this coming season. The valley's only outdoor ice skating rink - The Rink at Rancho Mirage - will be welcoming skaters from November 22nd through January 8th. The Rink will draw young and old alike and will be a focal point in a number of fun activities throughout the season, highlighted by a spectacular holiday celebration to include a tree lighting ceremony, live music and an ice skating Santa! I guarantee the temperature will not be in the present 100 degree category. Guests will also notice several upcoming physical improvements to the center. A brand new comprehensive sign program, inclusive of tenant signs and center monument signs, will be installed this fall. Accompanying the new signage will be a property wide fresh paint scheme and removal of the existing parking lot pole banners. Following the previously completed initial phase of landscaping improvements along the interior of the center, additional phases throughout the parking fields will also begin this fall. Plans for a single story parking deck with solar paneled covered parking and additional solar panel covered parking, along with new leasable tenant space in the existing parking lot are expected to be submitted to the City for consideration in early August. While this portion of the upcoming changes will take longer than the previously mentioned improvements, they are sure to be worth the wait and we look forward to seeing the final product."